Between the Gaspé Peninsula, Québec, and the shores of northern New Brunswick, near Dalhousie, lies a special marine site known as the Restigouche River Estuary. In this unique area, salt and fresh water mix on top of rich mudflats to produce an important habitat for many bird species. The estuary provides food (principally mussels, clams, and small fish) for waterfowl and seabirds, from early spring until freeze-up in early winter. More than thirty species of coastal birds are present at this estuary at one time or another during the year, including Surf Scoter, Red-breasted Merganser, and Barrow’s Goldeneye. Most notably, this site provides an important spring staging area for thousands (and in some cases, tens of thousands) of Black Scoters (Melanitta perspicillata) each year during their spring migration. Each year, as the ice begins to retreat after the long winter in northern New Brunswick, volunteer caretakers and naturalists scan the waters of the Restigouche River Estuary awaiting the arrival of spring migrants. 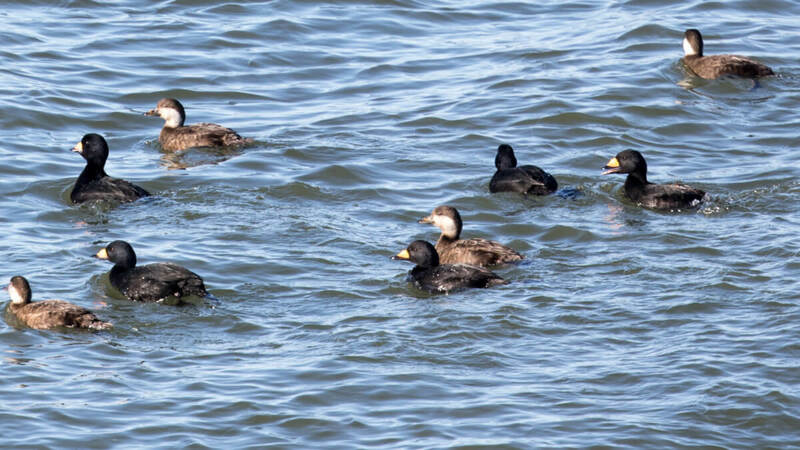 Interestingly, some monitoring studies have reported that Black Scoters only stop for a short time in the estuary before leaving, quickly replaced by hundreds or thousands of other birds all stopping on their journey toward their northern breeding grounds. The Restigouche River Estuary is one of over 25 sites that are designated Important Bird and Biodiversity areas (IBA) in New Brunswick. The IBA program is an international conservation initiative managed by BirdLife International; Nature Canada and Bird Studies Canada co-manage the IBA program in Canada, with Nature NB acting as the provincial coordinator here in New Brunswick. While the Restigouche River Estuary site is incredibly special and critical for birds, IBAs do not provide regulated protections to birds or their habitats. As a result, Nature NB relies on volunteers like Mike Lushington, our Caretaker for the Restigouche River Estuary IBA, to report on which birds use the IBA each year and what new or existing threats may affect these species. If you enjoy birdwatching, have an attachment to a special place, or simply want to contribute towards greater protection for birds in our province, please get in touch to learn more about how you can get involved in this amazing program. You can reach us at 506-459-4209 or [email protected]. We would love to hear from you!